All A Bunch Of Momsense: Our first Tax Tips! You have questions, hopefully, I have your answers! 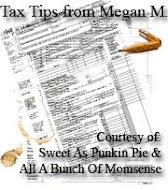 A few days ago, Julia from Sweet As Punkin Pie and I both invited you to anonymously share your tax questions with me. We are not going to close down that request, so keep asking- I'll keep answering! In the meantime, I wanted to share some of the questions and answers we've received so far! There is a lot of Tax Terminology involved in this stuff, so I'm going to try to define terms as I go along. If you get lost, please, ask for clarification! I'll be glad to help! Question: Can you write off donated breast milk as a charitable contribution? Since it could otherwise be sold? Answer: Not the milk itself. Depending on who you donate to, you may be able to deduct your expenses incurred, such as storage containers and mileage to and from a drop site, but the IRS will not give us a deduction on the value of our time or services. Publication 526 specifically refers to blood donation as being not deductible, but breast milk meets the same guidelines. If you are donating the breast milk, and you are giving it to a specific individual, then you may not take any deduction in regards to your donation. If you are donating to a qualifying milk bank, and receive no reimbursement for out of pocket expenses (bags/containers, transport or mailing expense), record those expenses, as they will be allowable. Please note that if you sell the milk, the income you generate should be included in your income. Question: I donate to charity and give stuff to goodwill, but it usually only comes out to about $2000 total throughout the year. is that enough for a deduction? i'm confused on how "gift donations" work? Answer: Charitable contributions are part of a larger group of allowable deductions called Itemized Deductions. These deductions are calculated on the Form 1040 Schedule A, and include an extensive list of things that may be deductible. The form is broken down into several sections, including Medical Expenses, Taxes Paid, Interest Paid, Charitable Contributions, Casualty Losses, Job Expenses, and Other Miscellaneous Deductions. First you must calculate how much in total itemized deductions you have. Then, you compare that number to the Standard Deduction. The Standard Deduction is an IRS-defined amount that is automatically deducted from your income before tax is calculated. The amount of your Standard Deduction is set by your filing status, but may also be impacted by your age, blindness, and if you are the dependent of another taxpayer. You are allowed to take the larger of the two figures- the Standard Deduction or the Itemized Deductions. By themselves, no, it is unlikely that you will receive any tax benefit from your $2,000 in charitable contributions. However, if you also have things like home mortgage interest, property taxes, and state and/or local income taxes, and your itemized deductions are now larger than your standard deduction, you should use those, and are receiving a tax benefit as a function of your donations! Question: How can you tell if it's better to file as married - jointly or married - filing separately? Answer: The absolute best way to know for sure is to run the return both ways, but there are a couple of quick things you can look at that might answer the question without going through all of that! See, Married Filing Separately is a filing status that automatically disqualifies you for a number of credits and tax benefits. For example, if you qualify for the Earned Income Tax Credit as a Married Filing Joint (MFJ) tax return, then you probably want to stick with that- taxpayers filing Married Filing Separately (MFS) aren't eligible for EITC. You also cannot claim any education credits, claim a deduction for student loan interest paid, or the Tuition and Fees deduction. Additionally, income guidelines for other tax benefits are reduced, and tax rates increase more quickly. Now, all that being said, I've had circumstances where filing returns MFS does work out to the benefit of the taxpayers. This is typically a function of major medical or employee business expenses on the Schedule A.
I'm frequently asked about filing separately as a function of a Federal Treasury Obligation that one of the two taxpayers may owe. For example, a couple comes in, and wants to file separately because she has a student loan that is in a delinquency status. Because an MFJ return means that both taxpayers are equally responsible for the return, including any refund, the government has the right to take ALL of the refund required to satisfy the outstanding debt. (Most common debts of this nature are child support, student loans, and state tax liabilities. You can verify if an offset is scheduled to occur by calling 1-800-304-3107.) In that circumstance, I encourage the taxpayers to still file a joint return, but to file a form 8379, Injured Spouse Allocation, with their return. While the return will take longer than is standard to process, the Injured Spouse form asks the IRS to divide the refund between the two taxpayers, and send only the portion of the refund that is attributable to the taxpayer who owes the debt to the offsetting agency. The remaining portion of the refund is then released to the taxpayers. Question: We purchased a home in 2005 and lived in it for 3 years. Last year we moved out and rented it, we are now selling the property as a short sale. So are we eligible for provisions of the economic stimulus or is this simply considered a short sale of an investment property where we would need to claim the loss fully and pay income tax? You have a property that you purchased for 200,000. You have borrowed a total of 250,000 against the property. Depreciation on the property during the time it was a rental was 2,000. The property now has an adjusted basis of 188,000. The loan balance is now 235,000. You sell the property for 215,000. The bank agrees to write off the 20,000. This gives you an effective sale price of 235,000. You include in your income 2,000 for the depreciation recapture. You also have a gain on the sale of the property, but because you met the rules to be eligible, you can exclude that gain under the Section 121 Exclusion. There are a couple of good examples as well here in regards to the exclusion. Basically, if you have a gain in excess of $250,000 ($500,000 for MFJ), then yes, you may have additional taxable income, but you definitely must claim the allowed depreciation. which will take you to my post where you can submit your questions.